I usually make it a point these days to avoid “freemium” games, as they often leave me feeling hollow. As much as I enjoy match-three games, I find IAPs ruin the experience for me. 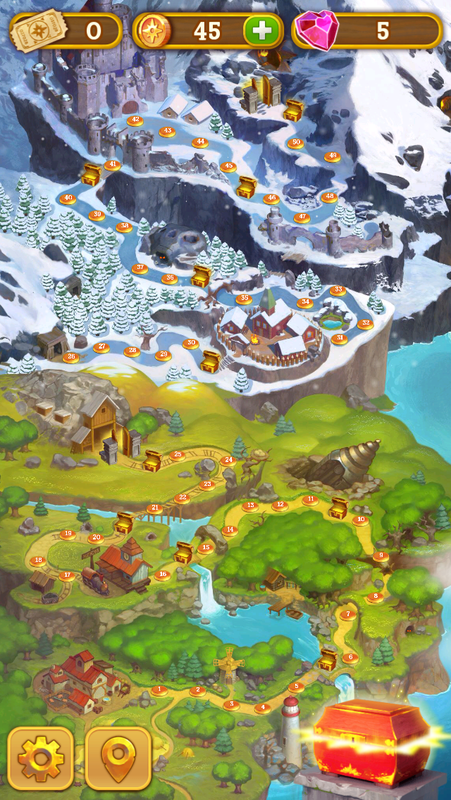 Gemcrafter: Puzzle Journey was made by Playmous, the folks behind God of Light, one of my all-time favorite iOS games. Therefore, I decided to give the game a chance despite my hesitancy. The game started off great. I got through the first fifteen levels or so without even thinking about in-app purchases (IAP). The game does introduce you to some free power-ups, hoping you’ll pay for more. But they weren’t needed yet. I made it through the first world (twenty-five levels) without much of a problem. And I was quite enjoying myself. Let me talk a bit about the gameplay. It’s a match-three game, with a hundred levels across four worlds. 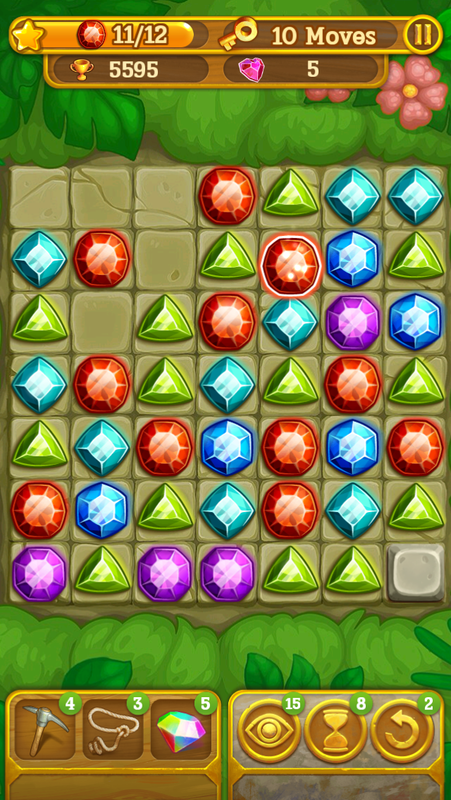 Each level starts with some gems on a board with specific placement. The idea is to match three or more of the same color, which will then create one gem of another color. 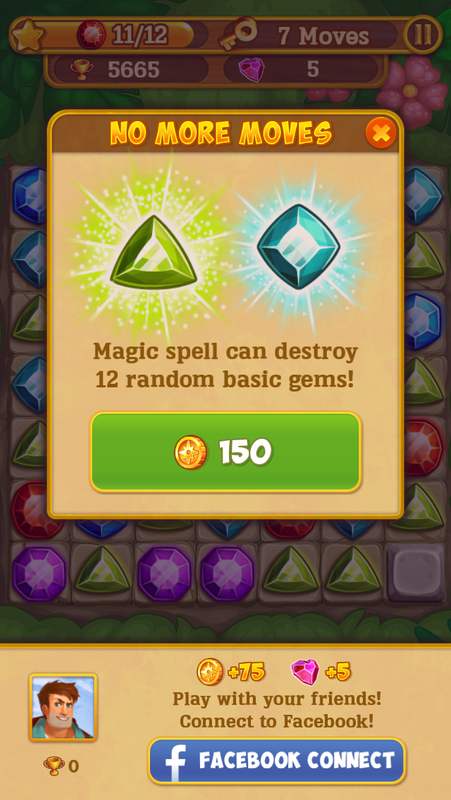 So three green gems become light blue, three light blue gems become dark blue, and so on. Unlike the usual match-three games, the board is mostly empty space. 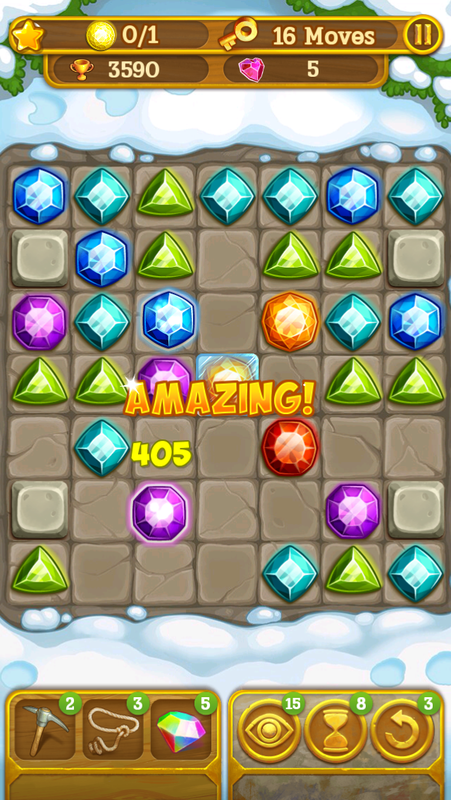 You can move a gem anywhere on the board, as long as its path isn’t blocked by other gems. 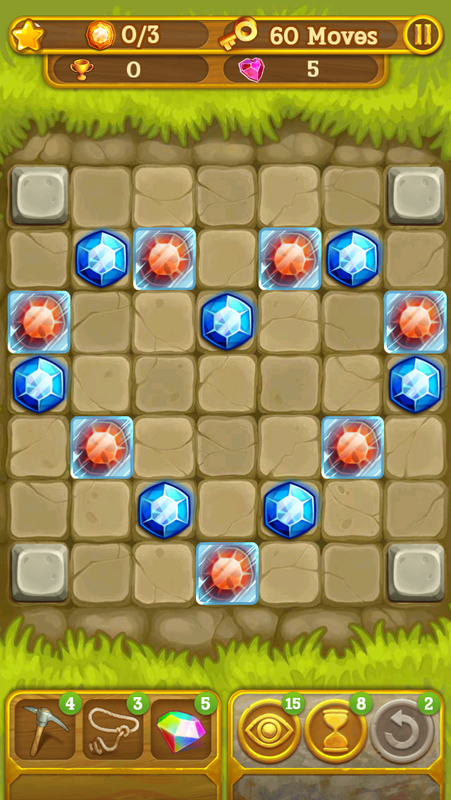 When you do make a move, a few more gems will pop up randomly, sometimes interfering with your strategy. If the board fills up and you run out of moves before you reach the goal, the game is over. If you match five of the same color, you get a floating gem, which can pass over other gems. 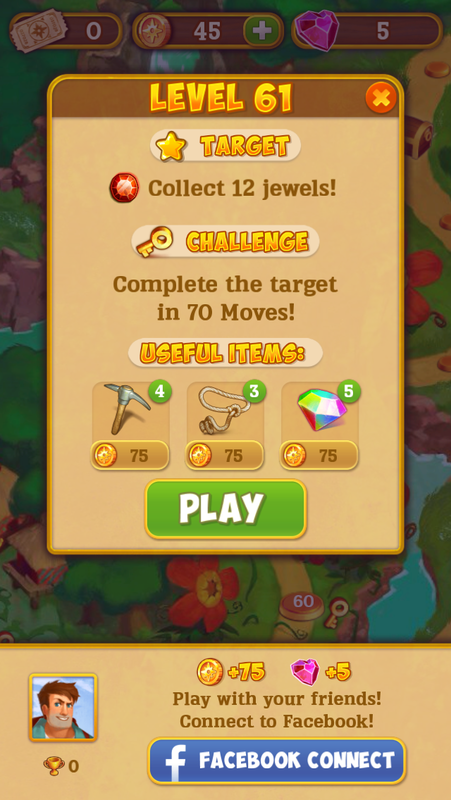 You can also get a floating gem by getting gems to jump up two colors in one move. These floating gems can mean the difference between a loss and win. Setting up the board to create them and then deciding how best to use them is one of the great strategic aspects of the game. 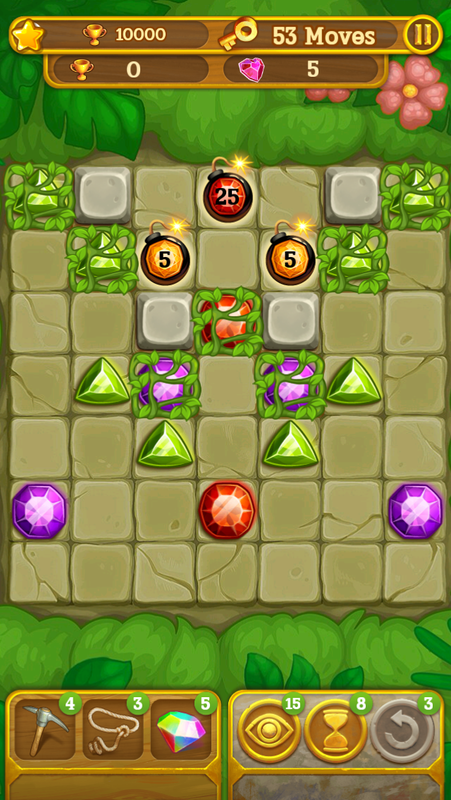 While each level design is set, the gem placements after each move are random. This means no two tries of the same level will ever be exactly the same. So if you are stuck on a level, a fresh start might be what you need to beat it. Each level has a goal and a challenge. 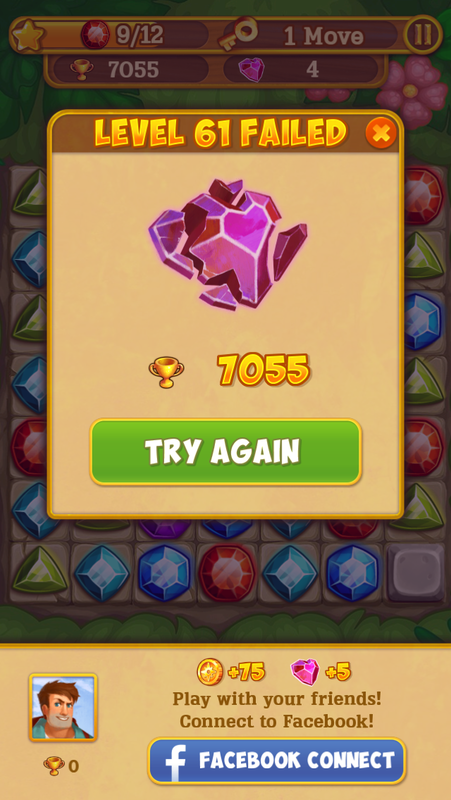 The goal is either to get a certain score, create a certain type of gem, or get rid of frozen gems. The challenge involves completing the goal under a certain number of moves. If you achieve the goal, you get a key. You can still go on to the next level without the key, but you need all twenty-five keys of a world to move on to the next world. It was the second world where I started feeling the weight of the IAP. The game does involve a lot of strategy, but there’s also quite a bit of luck. Bad luck can be your downfall the deeper you get into the game. The “undo” option you can buy starts to become very appealing at this point. But if you use them up and become dependent on them, it will cost you a pretty penny to keep them replenished. My absolute biggest gripe with the game is the limited lives, or retries. They get used up even if you try to quit the level the second you start it. You can only hold five lives at a time, and each one takes twenty minutes to replenish. If you use up all five lives, you either have to pay up, invite friends, or watch a video for more. The other option is to take a break from the game. Even if I want to ignore all the other IAP and pretend it’s just a really challenging game, the inability to just keep retrying a difficult level kills a lot of the fun I’m having with it. It means I’m more likely to just forget about the game and play something that doesn’t force me to quit. I did notice that if I closed the game down in middle of a level, I could restart without losing a life. This allowed me to keep retrying difficult levels, but it also became incredibly tedious to have to wait for the game to load up each time. This was probably also an oversight on the developer’s part, so I wouldn’t be surprised if this no longer works in an update. Besides the lives, you could also spend your money on power-ups that will make a level much easier. 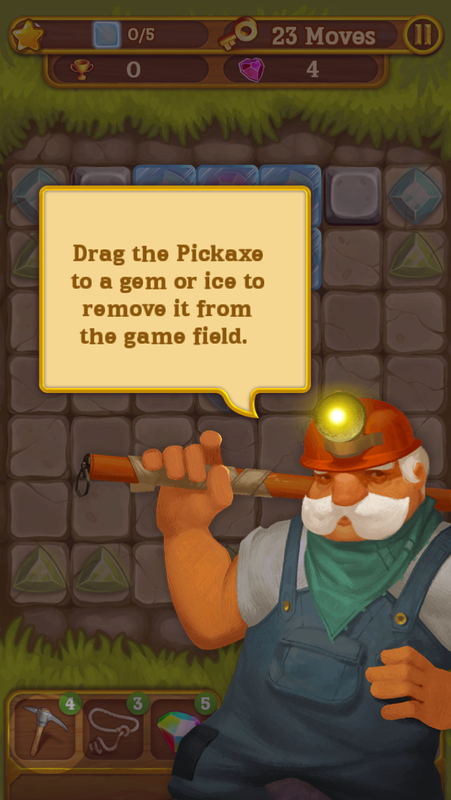 There’s the pick-axe that allows you to break a gem, and a lasso that lets you pull a gem off the board and place it anywhere else. You can even spend 150 in-game coins to continue a level when you lose. I like to play it “clean,” and I wanted to see how far I could get in the game without using any crutches that the game didn’t force on me. Despite having to restart some levels quite a few times by killing the app, I did manage to get through the second world, which is the halfway point of the game. I nearly didn’t make it through that fiftieth level to get to the third world, but my persistence paid off and I was able to do it without any power-ups or continues. The third world has been much more difficult, and even when I do manage to get past a level, I haven’t been able to get the key for most of them. This means I likely won’t make it to the fourth world without IAP or a serious amount of persistence. According to the developer, the power-ups don’t directly affect the GameCenter scores, but they can help you get a higher score by surviving for longer. I would find IAP power-ups in a GameCenter game more forgivable if using them lowered your score. Basically, if you could still use them to get you through the game, but you wouldn’t be competing at the top of the leaderboards. That would be reserved for those who did it without crutches. You also can’t see your high score for a level unless you’re logged into Facebook, so that makes it nearly impossible to try to improve your scores. I hope this is just an oversight, because the only replay-ability with a game like this is in going back and trying to do better on older levels. I would love to see some of these issues dealt with, and even maybe a premium, IAP-free version of the game. If this game had unlimited retries, zero IAP, and (dare I say it) no power-ups, I’d likely try to complete the game (assuming the difficulty was rebalanced for the lack of crutches). If I were to use a power-up, even if they were free, I wouldn’t feel like I’m winning the game, so much as cheating. But the puzzle and strategy aspect of the game is quite engaging, and has that “one more try” lure that has kept me playing a game well into the wee hours of the morning. To its credit, the game can be played online or offline, making it perfect for underground subway commutes. Even the tougher levels are pretty bite-sized, so they’re perfect for pick-up-and-go mobile gaming (as long as you don’t need to retry levels too many times). I have to admit, I die a little inside every time one of my favorite game developers turns to freemium games. Gamehive, the creators of the Antrim Escape trilogy, did this when they switched from high quality, use-your-brain point-and-click adventure to mindless clickers like Tap Titans. I hope that Playmous doesn’t make a habit of this, because they do have a knack for quality puzzle games. If you need help with the game, you can try my walkthrough guide with videos of many levels.